Four-wheel drive vs AWD: Which is better for Cincinnati roads? If your car has been sliding around a bit in this week's snow, you may be wondering if your next vehicle should be four-wheel drive, especially if it's a pickup or crossover SUV. But the decades old two-wheel drive vs four-wheel drive debate may not be a debate for much longer. Gary Heflin, owner of Courtesy Automotive in Cincinnati's Oakley neighborhood, says more and more cars are now selling with some sort of all-wheel power. "Forty-five percent of all new cars sold these days are either all-wheel drive or some type of four-wheel drive system," Heflin said. 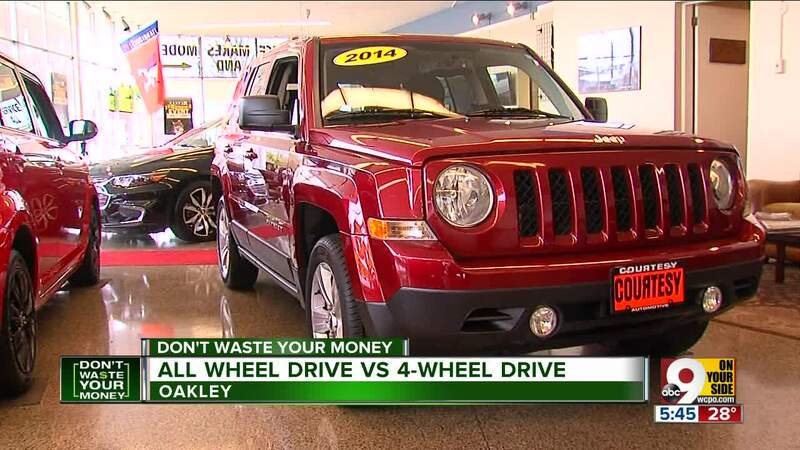 Some vehicles, like a Jeep Patriot on Courtesy's showroom floor, still have manual four-wheel drive. An "old school four-wheel drive," Heflin explained, has a switch between the seats that tells the transfer case to add the two front wheels to the drive system. It's a system that been used since World War II, and some drivers still love it. But more and more vehicles, like a 3-year old Honda CR-V he took us on a ride in, have computerized all-wheel drive, that kicks in only when it senses a wheel skidding in rain or snow. Helflin explained drivers only use it when it's needed, cutting down on tire wear and improving gas mileage. All-wheel drive (AWD) has surged in popularity the last few years, primarily because automakers are selling so many compact SUVs where AWD is standard on some of them. Heflin said unless you drive off road, AWD is the superior option for most people. "All-wheel drive eliminates all the guesswork of do I need to put it in, do I need to not have it in," Heflin said. Four-wheel drive (also known as 4x4) is best for deep snow, off-roading and loading boats into lakes. It lowers your gas mileage substantially and should not be used on dry pavement due to increased tire wear. All-wheel drive (AWD) is automatic and does the thinking for you. However, one downside is you may have to replace all four tires at once, to keep the computer sensors working properly. Some versions of AWD also give you the option of locking the wheels old-school style. Finally, you may not need either one. If your car comes standard with front wheel drive (like most Hondas, Toyotas, Ford's Escape and Chevy's Equinox) that may be enough for the occasional 3-inch Cincinnati snowstorm. Two-wheel drive has a gas mileage advantage due to less weight. But four-wheel drive gives you extra peace of mind in the worst weather, from the occasional winter snowstorm to summer downpours. All-wheel drive will cost about $2,000 - $3,000 more than standard two-wheel drive, but Heflin says you will get much of that back at trade-in time. "Its a year-round driving advantage." Heflin said.